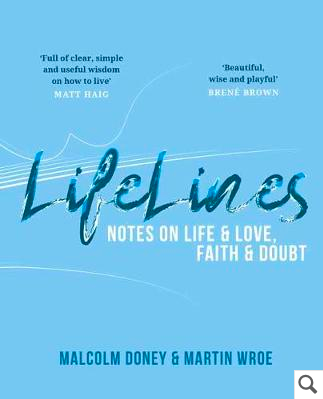 Lifelines: Notes on Life and Love, Faith and Doubt is a new book published in November 2018 written by Martin Rowe and Malcolm Doney, and to my mind it’s a perfect expression of a postmodern approach to religious belief. The two authors are (respectively) a volunteer priest and one volunteer vicar in their local parishes, and this voluntarism ticks the postmodernism box straight away – no doubt being a volunteer enables them to ‘dip into’ their religions and be involved without any of the more unpleasant commitments associated with going ‘full clergy’. To be honest I haven’t read it, but I caught a review of it by two people who had on Radio four on Sunday morning. (FINALY I get some payback for all the religious content I’m not normally interested in on a Sunday morning!). I’ve a had a quick browse of it and it basically provides tips on how to ‘lead a good, happy life’ and reflections on some of life’s ‘deeper questions’ and ‘moral issues’ – and the advice comes from people of many faiths, and no faith, which is kind of blurring the boundaries between the sacred and the profane. Anyway, just a quick update….. seems like a relevant piece of contemporary evidence for aspects of the beliefs in society course! Previous post: Is Religion a Source of Consensus or Conflict? Next post: How much more will I earn if I do a degree?